Tiny labyrinth charm. 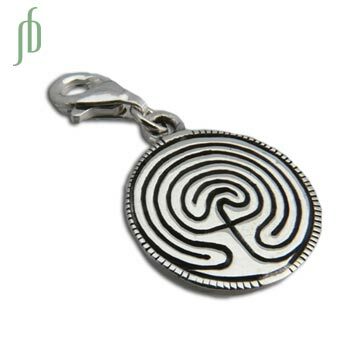 Labyrinths are sacred symbols dating back thousands of years. They have been and are used as meditation tools throughout many cultures. It is part of our charma collections and can be easily combined with any of our charmas good karma charms. The spring clasp makes it easy to change the charms around. Fun to wear on it's own or combine with other charms. 1.5 cm + 1 cm clasp, 2.7 g.
Conscious * ethical * charitable ...with these qualities in mind and action, Shanti Boutiqueï¿½ is a fair trade business committed to producing unique jewelry, positive for people and planet. A portion of our profits is donated to the Tibetan Childrenï¿½s Education Foundation (TCEF), an organization dedicated to the preservation of Tibetan culture in exile. To donate to TCEF directly or sponsor a child please visit TCEF's website . Shanti Boutiqueï¿½ is a proud member of the Fair Trade Federation. The Fair Trade Federation is an association of fair trade wholesalers, retailers, and producers whose members are committed to providing fair wages and good employment opportunities to economically disadvantaged artisans and farmers worldwide. Tiny om mani padme hum charm is made of sterling silver and has a spring clasp. Om mani padme hum is the buddhist mantra of compassion. You can add this charm to most of our necklaces, anklets or bracelets to make your own om mani padme hum jewelry. Om Mani Padme Hum is the Buddhist Mantra of Compassion. This Lotus Necklace has a matte finish with a Buddha meditating in the middle and om mani padme hum is written in Faux Sanskrit.